Who's ready for Halloween? Who's ready for more Halloween paper crafting? 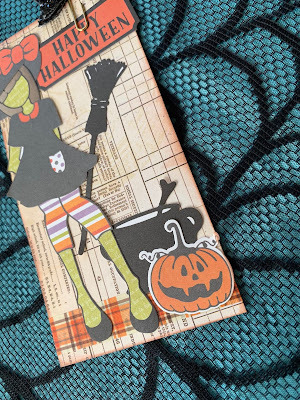 Have you seen Julie Nutting's Photo Play Bootiful Ephemera Pack? 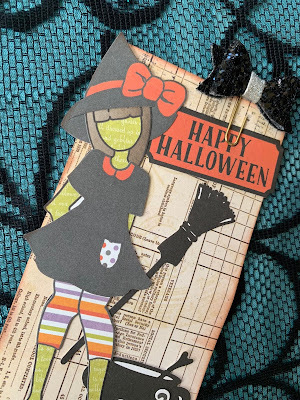 It's really cute and nostalgic because it's paper dolls, with witchy outfits and spooky cute accessories! You see there's lots of options to choose from to create a cute little witch! Here's what I chose for my Bootiful witch. For the background I used a paper strip from the Bo Bunny Wonderfully Wicked Ephemera. I styled the witch and adhered you to the left side of the paper. I tucked the broom in behind her because what's a witch without her broom?! 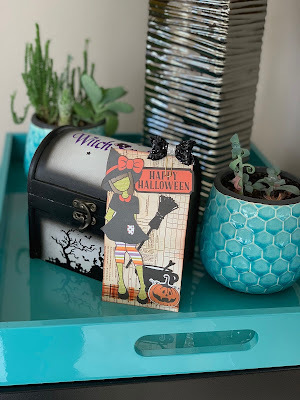 I added a strip of Simple Stories Simple Vintage Halloween Washi tape, Julie Nutting's cauldron and jack-o-lantern at the bottom and topped it all off with the glittery black Planner Clip from Prima Marketing. This bootiful witch can be added to your planner, made into a tag or just some spooky cute decor . Have fun with it, get creative and you'll love your little witch too! Such a cute and creative tag!